Private jet charter provider Skyjet realized the opportunity in supplying its niche group of customers with an app featuring on-demand booking, and quickly moved to provide a superior customer experience in the marketplace. Read how the app’s real-time pricing tool now processes roughly 1,500 user itineraries on a weekly basis, and has more than 22,000 downloads since its launch. This case study is a Reader’s Choice nominee for the MarketingSherpa Summit 2017 Awards, the first of four that will be published over the next month. Skyjet was chosen by our panel of judges for this campaign’s focus on customer-centric innovation of the booking experience, and the seamless integration of the company’s value proposition within its app. “Our clients are ultra-high net worth individuals, high-powered business and leisure travelers who are constantly on the go,” said Jonathan Levey, Digital Marketing Manager, Skyjet. On-demand private jet charter provider Skyjet, founded in 1997, found itself in the midst of the mobile revolution in early 2015. 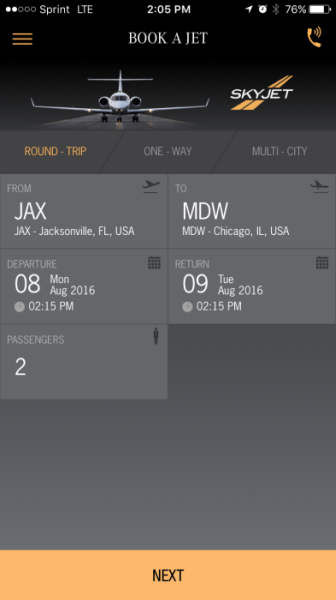 The goal, Levey added, is to provide a seamless, flexible and intuitive booking experience for Skyjet’s clients. Of late, this group includes a large section of mobile-first clients – business and leisure travelers who look to their phones to make bookings and access trip information at a moment’s notice. 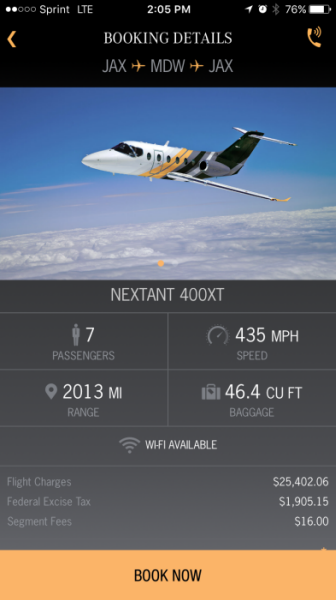 “We are an aviation company first and foremost, and so we take pride in making it as easy as possible for people to travel by accessing private aircraft in an on-demand fashion,” said Greg Richman, President, Skyjet. In early 2015, Levey and his team identified an opportunity to leverage mobile based on an impressive trend in Skyjet web analytics. That was the final push into implementing the app, he said, especially since as the global economy has been strengthening, business has been growing, but so has competition. What differentiates Skyjet in a complex market is consistently delivering an experience that empowers customers to shop intelligently, and with full transparency of cost, according to Levey. The emergence of new technology has offered up unique opportunities to do just that, he said. In this case, launching the Skyjet app in August 2015. “Within seconds of entering their desired itinerary, the app provides users with instant price estimates based on current market pricing and what other clients recently paid for their trips,” he said. As the only adopter of Apple Pay within the private jet charter industry, the app launched in August 2015 and pioneered a new mobile booking experience. “We cater to thousands of clients through our nearly 20 years of operation,” said Richman. “The high level of personalization that they have come to appreciate and continue to expect is ever-present on our mobile app,” said Richman. The goal of the campaign was to provide a seamless, flexible, intuitive booking experience for mobile-first clients. “We've been around since 1997. So Skyjet releasing an app is just another offering, another way for people to do business with us in addition to the website … email and phone,” Levey said. Although it was just another avenue for customers to book and interact, he added that the team began reviewing other apps in the marketplace to see how Skyjet could continue to offer a superior experience. “We evaluated all the competitors' apps in the marketplace, looking for not necessarily ideas, but seeing what they did well and seeing what they didn't do well and that was sort of a benchmark. We could determine what our app should feature and how seamless we wanted it to be for clients,” Levey said. Once it was determined the team could move forward with creating a mobile app, Levey and his team partnered with an app creation vendor, working with them on the design, development, UI design, UX design and the engineering. One of Skyjet’s main value propositions is the ability of its system to instantly calculate and process an itinerary, evaluating different variables to give customers a price within seconds. This process is deeply optimized from many competitors, who in order to provide a firm price have to wait while sourcing and quotes are put together for a client. Then, in order for a client to book one of the quotes, they have to either “print, sign and scan or fax a contract back to the charter broker, then they have to do a wire transfer or give their credit card information over the phone,” Levey said. Skyjet, he added, took that whole transaction process and implemented it into one section of the app. A big part of this was the decision to integrate Apple Pay in the app. This differentiated Skyjet to customers since they are the only one of their competitors to offer it in an app. It also relieves a customer concern over trust and privacy with personal payment details. “Skyjet’s integration with Apple Pay, the safer way to pay, enables users to simply book a private jet with the touch of a finger. Since security and privacy is at the core of Apple Pay, our clients have peace of mind when booking through Skyjet,” he said. This has significantly changed the way Skyjet does business, from even earlier this year, he added. The website provides the same booking experience, with the only differentiator being that the app has Apple Pay. After the first version of the app was released, Levey and his team began A/B testing the smaller, but important, aspects of the booking experience, such as push notifications. “We track everything in the app using analytics. We have made changes and updates to the app to make it a better experience based off of that,” he said. They began by changing a color element of the app by making sure that the color orange was only used when tied to an action. For example, a “Book Now” button, or a phone icon to call a representative. They have also started incorporating more images into the app to make it a better experience for customers, he said. Also, changing elements like push notifications to be more personalized to customers. As long as the request put into the app is at least 48 hours prior to the departure time and within the contiguous United States, the booking options will be instant, he said. This push notification would be for people who wanted to request a custom quote. “We made it more contextually relevant. But we didn't have a lot of people subscribe to push notifications anyway,” he said. This was something they would address in the second version. Another example of a small, but vital, detail added through the design and development of the app, was a call button in the form of a phone icon in the top right of the screen. This allowed clients to have “instant access to our dedicated aviation experts 24/7, who can answer any questions and fulfill client requests such as on ground transportation or catering, but really if at any point someone using the app has any questions, they can call and be connected,” he said. “From the moment the app is opened to when the client arrives at their destination, we’ve always made it a goal to deliver exceptional service to meet each client's unique travel needs,” Levey said. This means consistently developing the app to meet customer needs, and grow with them. During the development of the first version of the app, Levey and his team had weekly check-ins with the vendor, but “now that it's developed, we look to iterate on the app on a monthly basis. We're constantly evaluating ways that we can improve it,” he said. During the first week of August 2016, version 2.2 of the app was released as an update for customers, featuring a “soft ask” for push permissions. Instant booking was released as an update in April 2016. “We identified an area where we can improve the app and that was with push notifications,” he said. After identifying key experience points that would explain to users why they would likely be interested in receiving push notifications, they created a “soft ask” for customers. This was tricky at first because “the iOS-native subscription modal is a point of no return. You're only allowed to [ask users to subscribe] one time. If the user hits ‘yes,’ they're subscribed. If the user hits ‘no,’ they are not permitting push notifications,” he said. The only way to get users to subscribe in the future is by actually linking them to the settings app on the iPhone, which takes them out of the app, he added. By implementing a soft ask, users would have a chance to hit “not now” and Skyjet would retain the opportunity to try to subscribe them at a later time. “This could be a very successful way to open up a new channel of marketing communications to our users of the app,” he said. The team identified areas where they could insert a soft ask that would be relevant to the customer at that time. For instance, if they performed a pre-defined number of searches in the app without booking. “We display a screen which says, ‘we see you've been searching for jets but haven't booked a trip yet. We can notify you when we have deals. Subscribe — yes, or not now?’ Those are the two buttons,” he said. After the user has requested a quote and sees the thank you screen, another screen appears that says, "We can notify you as soon as your on-demand expert has your flight options prepared," and then the call-to-action to subscribe to push notifications is featured. The other point is when the user has booked a jet or confirmed and paid for a quote, the app will show them a screen that says they can be notified as soon as the trip is confirmed, and with any updates leading up to travel. “That was an area that we saw that we needed to take advantage of, and leverage to open up a new marketing channel for subscription marketing communications,” Levey said. “It was a lot of work for the sales team to follow up on each and every quote request we used to receive to vet the sales opportunity,” Levey said. The app essentially qualifies leads before they were actually submitted, he added. “From a sales side of things, it's … more efficient. Now the sales team can focus on their regular clients and service and their book of business better, following up with the people that have flown in the past to see how we can be of assistance with their travel needs,” he said. Overall with the release of version two, Levey said, this app helped to transform Skyjet into the first U.S.-based private jet charter provider to offer instant booking without membership fees, upfront costs or repositioning fees. “Our iPhone app is not the only way to book through Skyjet. It's just another avenue or another method. We're just making it easier and more accessible for people to book. It opens up a new channel,” Levey said. More than 22,000 people have downloaded the Skyjet app since its release in August 2015, according to Levey. The app had a 38% average week-over-week user acquisition growth rate during the first 12 weeks in the App Store. “We average about 500 to 600 installs in a week,” he said. There have been roughly 1,500 itineraries processed by the app’s real-time pricing tool on a weekly basis in Q2 2016.